This is an attractive plant with large, arrow-shaped, glossy green leaves that are heavily marbled with cream and, in time, make a dense carpet that covers the ground from late autumn till mid spring. In spring the pale green spathes grow well above the leaves, followed in autumn by a display of vivid red berries. The plants grow particularly well in moist shade under trees and shrubs. Within a few years they build up to form large clumps, and, once mature plants start flowering and fruiting, self-sown seedlings may appear. Most parts of this plant are poisonous, particularly the berries. 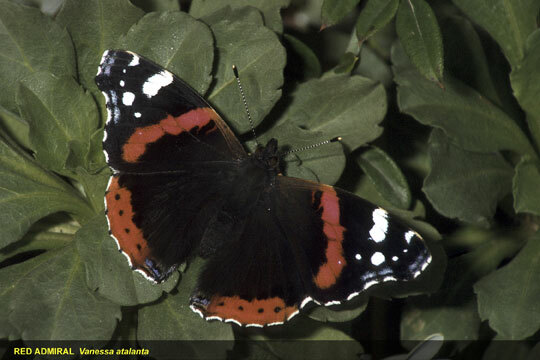 ​​Red Admirals are a migrant species, visiting us from North Africa and Europe between March and November. However, as our winters become milder, more and more have been staying year round in Britain. Red Admirals have dark black-brown wings, each with an orange-red band. The fore wing tips are black with white spots; the underside is orange, blue and white, while the hind wings are camouflaged dark brown. During September, the butterfly feeds on rotten fruits and nectar from garden and wild flower species, including ivy, which is one of the latest abundant flowering species. ​As the name suggests, the Speckled wood butterfly occurs in woodlands with partial sunlight, appearing to "dance in the air" high in the tree tops and often stopping to rest in a sunny spot. The adults feed on honeydew and the caterpillars on grasses, including Cocksfoot and False-brome. With a lack of bright colours, this more camouflaged butterfly can be identified by the cream-bordered rings on its wings.